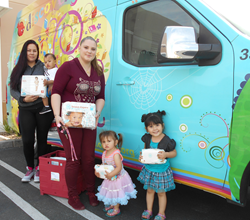 CCRC is partnering with The Honest Company, buybuy BABY and Babies “R” Us to help eliminate diaper need in California. According to the White House, almost 1 in 3 American families struggle to provide clean, dry diapers. At as much as $100 a month for one child, diapers are a pricey necessity just as important as food and shelter. Unlike many other essentials, though, there are no federal assistance programs for diapers. That means some low-income families may stretch the time between diaper changes, or reuse wet diapers, to make the most of their limited supply of costly disposables. There’s no reason caregivers should have to choose between feeding and changing their babies. To help low-income families provide diapers for their children, please stop by one of CCRC’s centers to donate disposable diapers or make an online donation at http://www.ccrcca.org. Contact CCRC Communications at 1-866-67-4KIDS to let us know if your organization would like to partner with CCRC to help fight diaper disparity. About Child Care Resource Center: The Child Care Resource Center (CCRC) cultivates child, family and community well-being. The agency serves the northern Los Angeles County region and the entirety of San Bernardino County.